Thank you very much for subscribing to SCUBA News. I hope you enjoy it. If you would like to contribute an article, please get in touch. Dive numbers have dropped in the Kingdom of Saudi Arabia as visa restrictions means that fewer dive tour operators are offering trips. The main diving areas are around Jeddah and Yanbu which is 300 km north. There are also good reefs south of Jeddah. In an earlier issue Trish asked whether an HSE diving qualification would be recognised abroad. 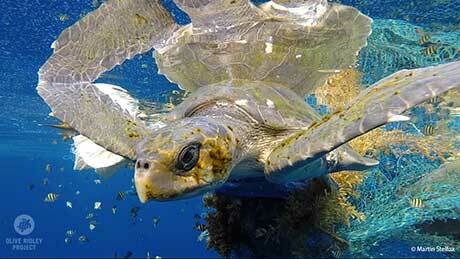 World Animal Protection are asking divers to report "ghost" fishing gear. They say that an estimated 640,000 tonnes of fishing gear is lost or abandoned in our oceans each year, entangling and killing millions of animals including seals, turtles and whales. When you see or remove any ghost gear, you can upload your sighting which will then appear on a map. This will enable the animal welfare charity to identify which are the most common types of ghost gear and from where they come. The information will be used to as evidence to convince governments and industry to create safer, cleaner oceans for animals. Identifying ghost gear hotspots lets volunteers take urgent action wherever sea animals are most at risk. Sardines, anchovies and pilchards are moving increasingly further north, occupying the higher temperature environments that are now found there. Brazil can transform this moment of political turmoil into positive action, and become a leader among developing countries facing widespread extinction of aquatic animals. `Invasive lionfish are a serious threat to Florida's saltwater fishing industry - the second largest in the nation - and the thousands of jobs it supports, according to an economic commentary from Florida TaxWatch. A common misunderstanding is that any species found living in a new habitat is an invasive species. Many of these, rather, are introduced species, a category that includes any species found outside of its natural habitat due to human actions. Scientists identified almost 1,500 new creatures in the world's oceans last year, including a humpbacked dolphin and a giant jellyfish and reckon that most species of marine life are yet to be found. Remote monitoring of large swathes of inaccessible ocean from satellites that orbit the Earth some 700 km above our heads is set to revolutionise the way that marine biologists study the ocean. A research study by the Oregon Department of Fish and Wildlife and Pacific States Marine Fisheries Commission has found that attaching of a series of LED lights to the fishing line of a shrimp trawl can significantly reduce bycatch.